Veronica Ferres is one of Germany’s top actresses today. She has won many accolades for her performances in films, all leading up to her international roles in Klimt opposite John Malkovich and The Comedian with Robert De Niro. One of her dreams was to work with the auteur Werner Herzog and that dream came true with her latest film Salt and Fire, coming to iTunes and VOD on April 4 followed by a theatrical release on April 7. World Film Geek had the chance to speak to Ferres about her experiences in making the film. First of all Veronica, thank you for taking the time out of schedule to talk about Salt and Fire. I’ve been a huge admirer of Werner Herzog since I studied at university, in theater and psychology. I saw Fitzcarraldo and it changed my life. It had such an impact, I mean, I’ve never seen a more powerful movie and I thought, if a movie can change my life, then I want to be a star in movies. And then it was such a strange coincidence. I was traveling to Berlin and when I walked into the airplane, in the first row were Werner and his wife. And just the day before, I was reading one of his novels that he wrote from walking on ice. So I had the book in my hands and I was thinking whether I should get an autograph. And someone I was traveling with, they were saying, “Do it, you will never get an opportunity like that again”. So I walked up to him and I said, “Hello Mr. Herzog. My name is Veronica Ferres.” And he said, “I know you!” (laughs) and he wrote me a nice autograph. He then asked me for my e-mail address and said he wrote a feature film for me. And I was excited because I was thinking I was going to have a part in a Werner Herzog film and it was going to have Michael Shannon and Gael Garcia Bernal. And Werner has always believed it is about the power of feelings and it was amazing. What was it like working with Michael Shannon [who plays Matt]? Michael Shannon is very respectful yet very shy. He’s a true professional. I think he is one of the best actors in the world. He’s very supportive and well-prepared. When I traveled to Bolivia, my father had just passed away five days before we were shooting so I arrived and I was so vulnerable. He immediately helped me with my situation. I mean we talked and talked and talked. So we became friends and we were shooting at 15,000 feet of altitude. And then on the salt desert and we had no internet, no telephone, no television, nothing. In your own words, can you describe your character of Laura? Laura is a scientist, she’s a professor. She’s part of a delegation going to South America because they want to do some research on a natural disaster and she finds herself taken hostage. She’s separated from her group and she doesn’t know if she’s going to die in the next hour, day, week. 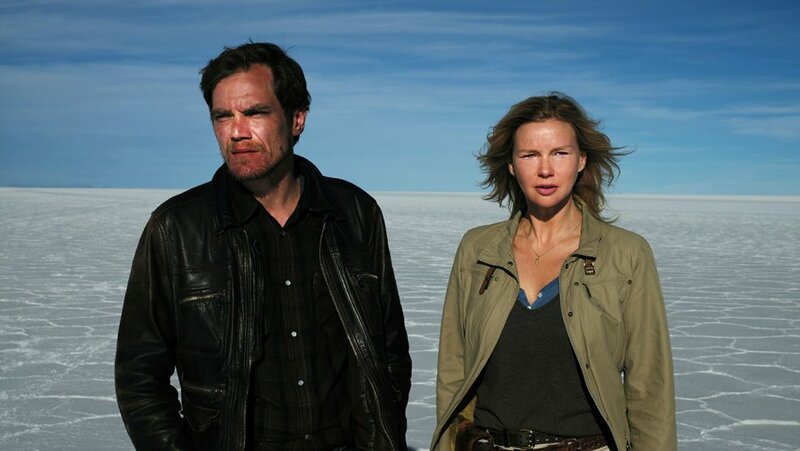 She is living with this fear and Michael Shannon’s character takes her to the salt desert with two blind boys and she has to learn how to survive. This is a typical Werner Herzog film. He likes to put his characters in the extremes of nature and shows the beauty of that nature. Yet at the same time, it is life-threatening and the characters must figure out how to deal with nature. And these three characters can have fun and be happy knowing that they are going to die eventually. It is so symbolic, such a strong feeling for me. That was actually my favorite part of the film. Your bonding with the two boys. Yes. Nobody knows what is going to happen so if you can be happy without knowing what is going to happen, that is the biggest magic. That is the biggest power a person can have on Earth. What would you consider to be your favorite part of shooting the film? I would guess it would be being perhaps in the salt desert because the way it was shot, it was so beautiful. The salt desert was actually the most beautiful thing I actually experienced in my whole life and not just as an actress. But in reality, it was actually quite dangerous and low because there were people who were dying because they would be driving in these deserts. And because there was a lot of salt, there was basically no cell phone signals so no one was able to call if they were to get stuck. These deserts are as big as California, and there is nothing working. No navigation system, no compass, nothing. So people would just be driving in circles and this is something you don’t normally see everyday. It’s just white, white, white, and salt. We had very experienced locals who would drive everyday to this small island near the deserts for us and the location where we were staying, it was so bad that there were times when there was no running water. One day at 4 in the morning, Werner woke me up and said, “Veronica, get out of bed!” I asked what was wrong and he told me the crew is going to leave because it is now the third day without water. He asked me to go there and I was in my pajamas running to the crew. I told the crew not to leave. I said, “Please, I love you guys so much. When the water comes back on, I will throw you all a special party.” And they stayed and that night, the water was running again, so we were able to take showers, wash up and brush our teeth. That’s a relief. Is there a message you hope to convey with this film? Never give up and love nature, it’s uniqueness, poetry, and beauty. Finally, do you have any new projects in the works? Yes. Actually I am doing a movie with Keanu Reeves and another one as well. Great! Salt and Fire comes to iTunes and VOD on April 4 and in select theaters on April 7. I hope everyone gets to see you in this film as I thought you did a great job as well as the rest of the cast. Well, thank you so much! That means a lot hearing that. I appreciate it! A special Thank You goes out to Katrina Wan PR and Veronica Ferres for making this interview possible.